Commotion in the Ocean by Giles Andreae & David Wojtowycz – This book has a collection of poems about ocean creatures in it. It can be read as a whole story, or each page can be read as its own poem. There are plenty of simple and humorous rhymes about crabs, turtles, dolphins, angel fish, jellyfish and much more! The colours are vibrant and R loved flipping through it! 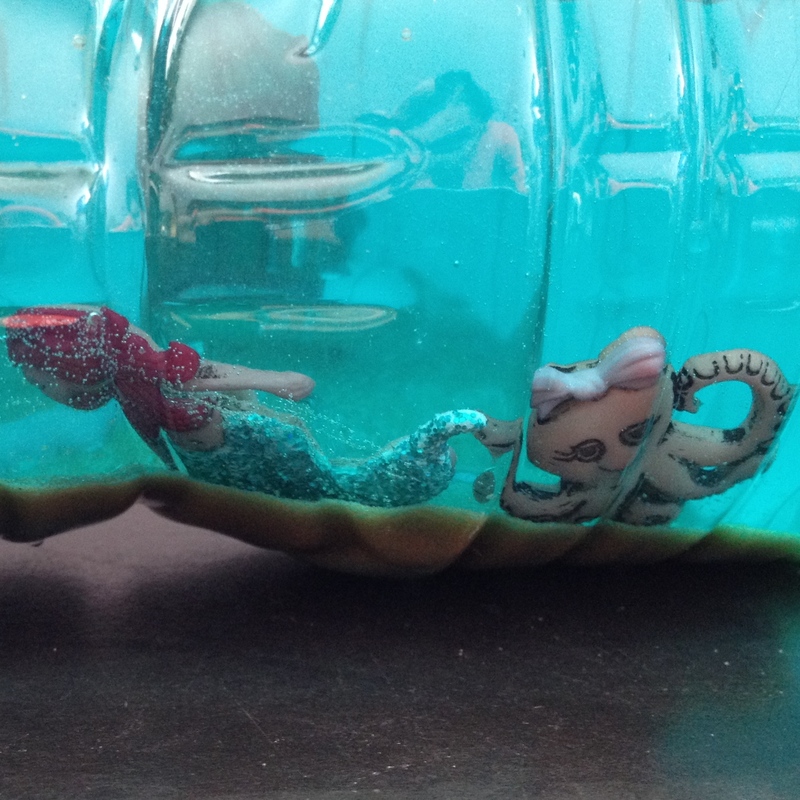 I made an “I spy” sensory bottle with three ocean animals that R is familiar with (octopus, fish and crab) and a variety of ocean items that are new to her. I put sand at the bottom of a plastic water bottle and poured coloured water on top. I had coloured the water with two drops of blue food colouring and one drop of green food colouring. I showed her each of the items before putting them into the bottle and paid closer attention to the three she recognized. We named the three animals she was familiar with and she did the signs we have made up for them. For octopus, she wiggles her arms by her sides. For fish, she joins her hands together and makes them “swim”. And for crab, she holds her hands out to her sides with her palms facing up and makes a snapping motion with her fingers. Once I placed all 8 items inside the water bottle containing sand and water, we shook the bootle, waited for the sand to settle and then searched for the octopus, crab and fish. When R would spot an item she recognized, she did the action for it. a. For older children, bring phonemic awareness into the “I Spy” game. Ask the child to find an object that begins with a specific letter. For example, you can ask the child to find an object that begins with the letter O.
b. Continue the “I Spy” game with beginning sounds. 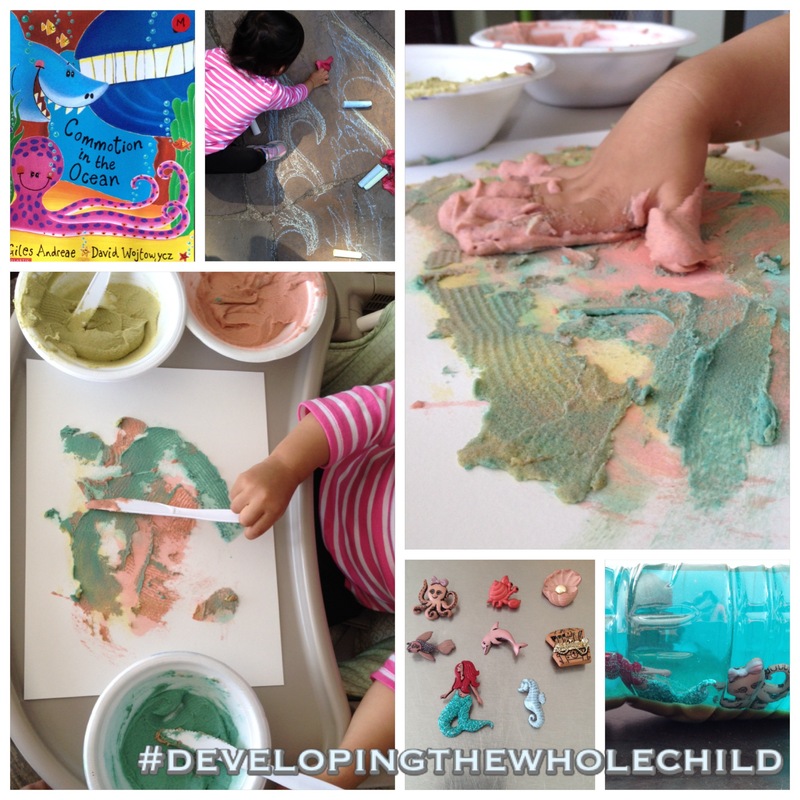 Ask the child to find an object that begins with a specific sound. For example, you can ask the child to find an object that begins with the sound “o”. c. For a harder challenge, ask the child to find an object that ENDS with a specific letter or letter sound. Before going outside, we looked at videos of ocean waves on youtube. I used the vocabulary word, “waves” while pointing at the waves on the screen. 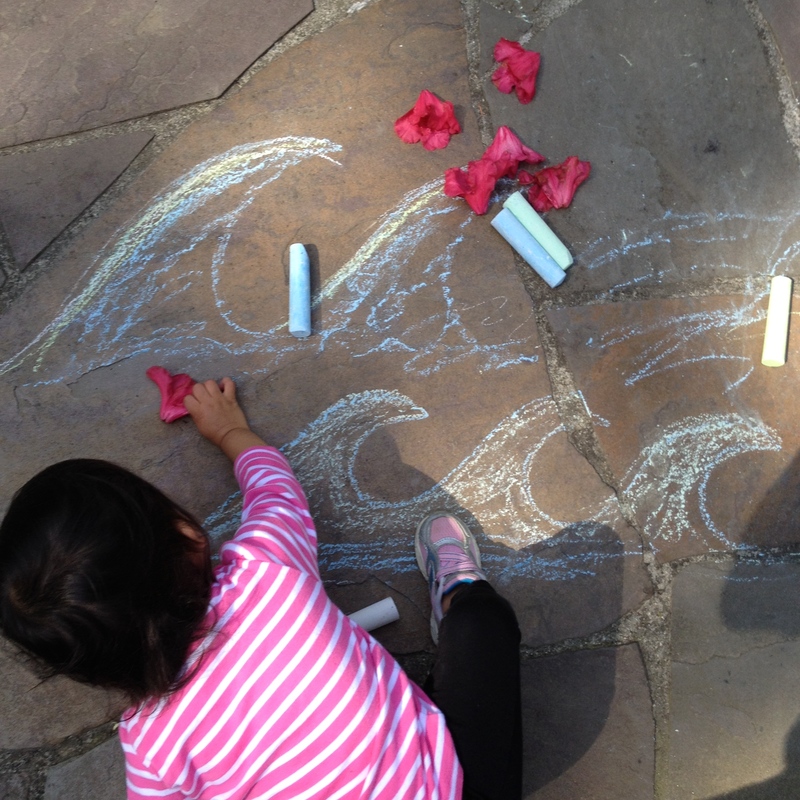 We then headed outside with the sidewalk chalk and I made some ocean waves while R made some long strokes. She thought it was necessary to add flowers to our sketch, so she got up, collected some flowers that had fallen and started scattering them about. The ants then caught her attention and she squealed at them and tried to pick them up! This was R’s favourite activity of the day. 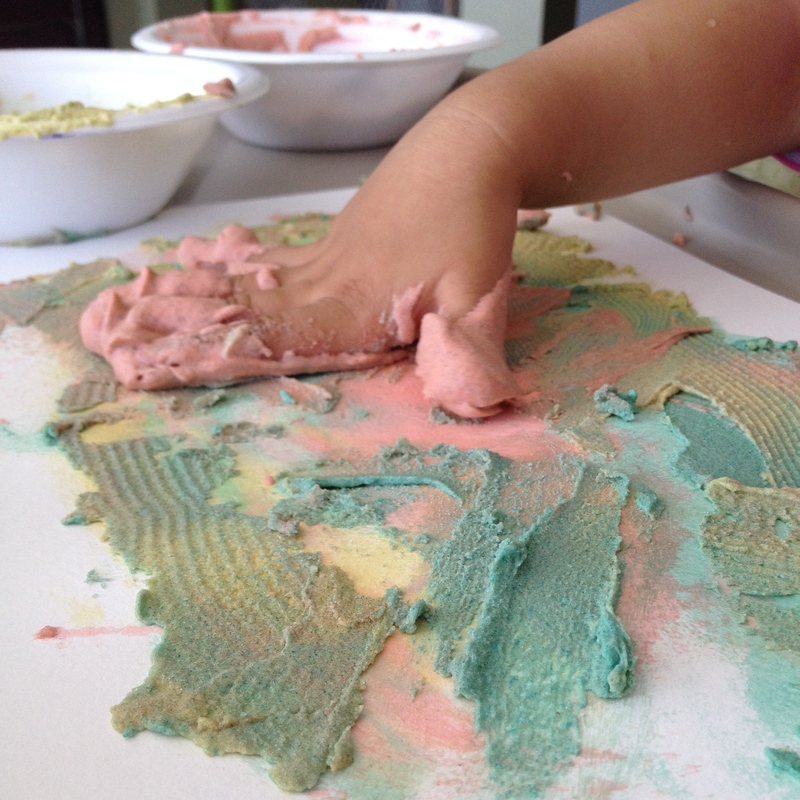 I mixed 1/2 a cup of brown decor sand with about a tablespoon of shaving gel and 4 drop of food colouring. Using a rubber spatula, I mixed up the three ingredients. The shaving gel turns into a foam as it mixes. 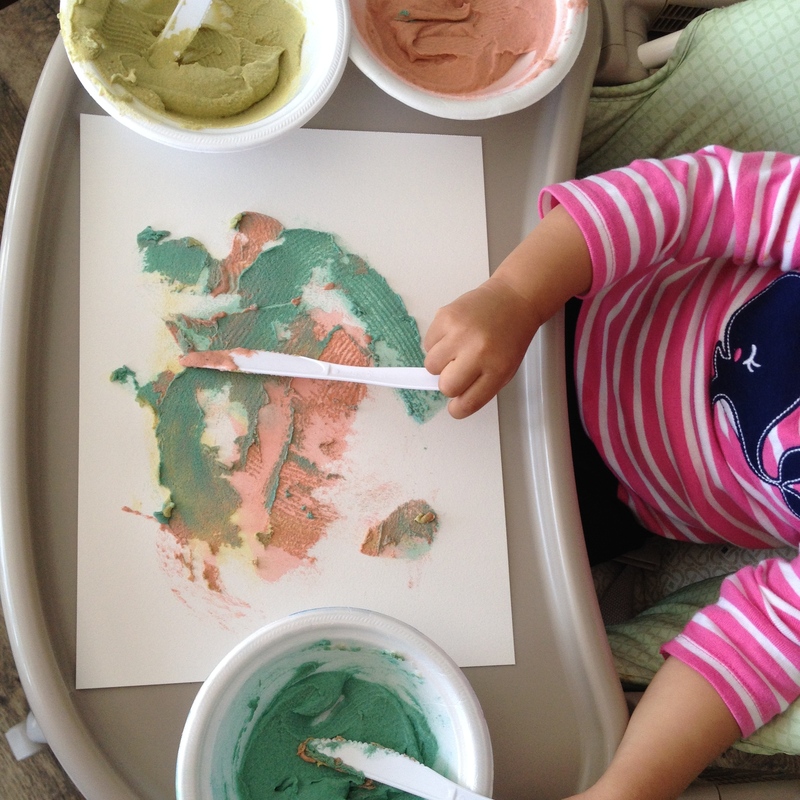 R used a new tool to paint with today. 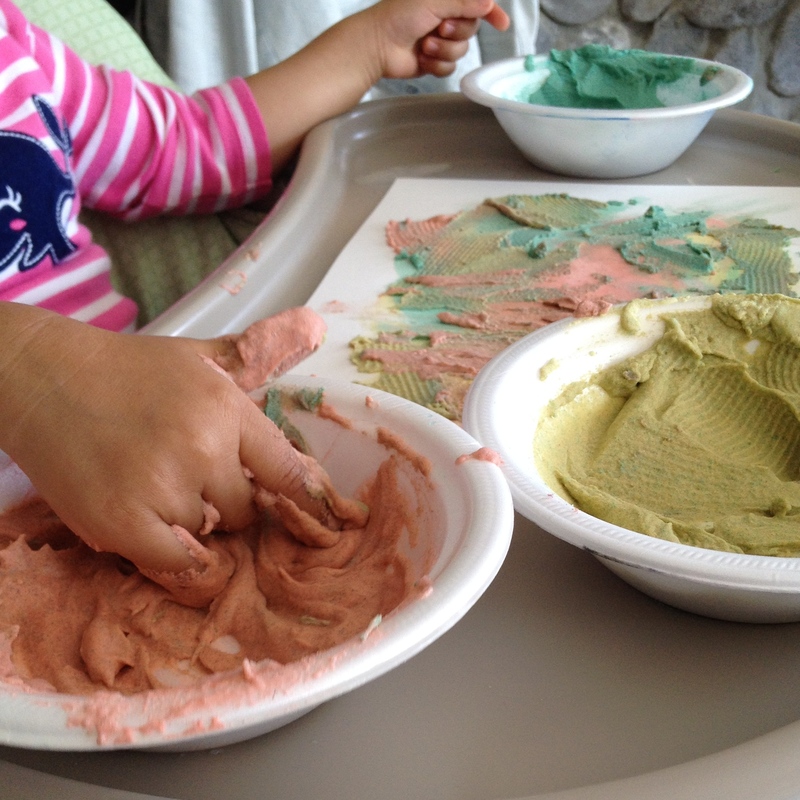 She began with using the plastic butter knife to smear and scrape the paint on (more difficult than you think, for a toddler!!) and then quickly proceeded to smearing and squishing the puffy sand with her hands. She really enjoyed oozing the puffy sand between her fingers and continued to do so until her hands were good and stained. a. Have the child paint an ocean scene with the puffy paint. b. 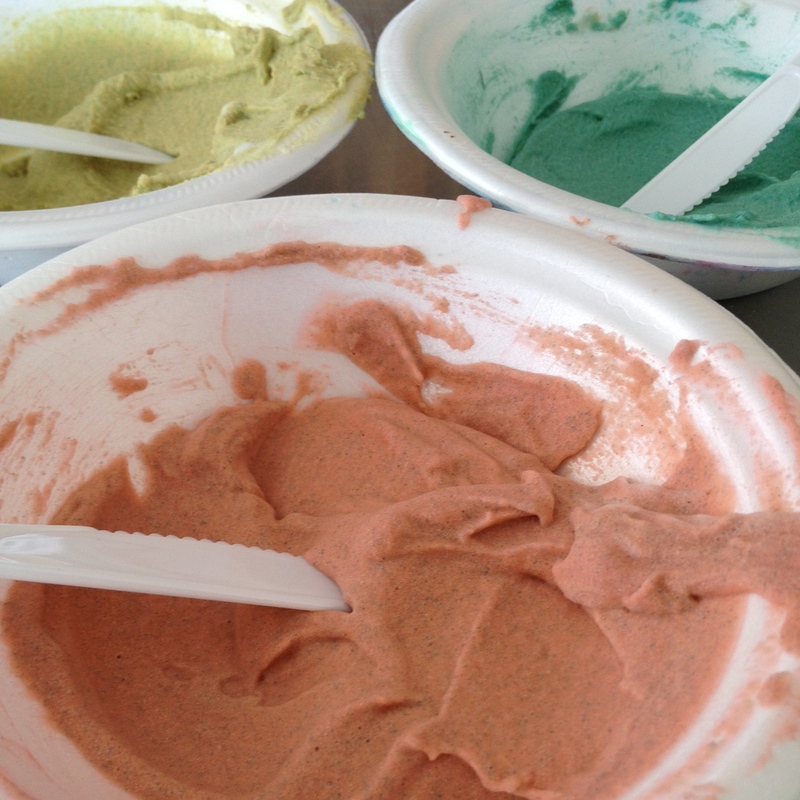 Explore colour mixing and discuss what happens when two colours are mixed together and when all three are mixed together. After exploring a few of the web sites on your own site, I really such as your methods of blogging. me aware what you consider.